The biceps muscle extends from the shoulder to the elbow. Its primary function is to rotate the forearm and help bend the elbow. Tendons act as attachments between muscles and bones. There are two biceps tendons that attach the biceps muscle to the shoulder bones and one tendon that attaches biceps muscle to the radius bone in the elbow. Biceps tendon rupture can occur at either the shoulder or the elbow. Biceps tendon rupture at its insertion into the shoulder is called proximal biceps tendon rupture. The two main causes of proximal biceps tendon rupture are injury and overuse. Proximal biceps tendon rupture at the shoulder usually occurs in older individuals due to age-related degenerative changes within the biceps tendon. Proximal biceps tendon rupture can occur in young athletes such as weight lifters and in individuals with jobs which require heavy overhead lifting, or in those who play repetitive overhead sports, such as swimming or tennis. Smoking and steroid medication use have been linked to increased muscle and tendon weakness. In addition, rotator cuff injuries, shoulder impingement and tendonitis are some conditions that may accompany a proximal biceps tendon tear. 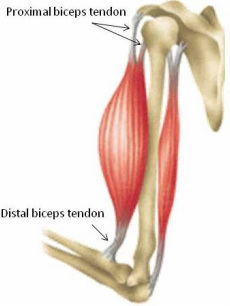 Usually, a biceps tendon tear can be diagnosed by the history of an injury and physical examination alone. Usually, patients experience sudden shoulder pain with an audible snap or pop, and even pain relief after the rupture. Bruising of the upper arm is common and as the tendon retract, swelling or a bluge in the lower part of the arm is created by the recoiled biceps muscle. Patients usually do not notice any decrease in the range of motion of the shoulder or arm but may complain of weakness and difficulty turning the arm palm up or palm down. X-rays are useful in ruling out other problems that can cause shoulder and elbow pain. Occasionally, an MRI is needed to differentiate between a partial and complete tear. Nonoperative treatment is consideration for elderly and inactive patients or for those who are at high medical risk to undergo general anesthesia. It consists of rest, cold packs, antiinflammatory medication, and physical therapy, which helps to restore movement and strengthen the shoulder. This type of treatment results in recovery of about 60% of the normal biceps tendon strength. Surgical repair of the proximal biceps tendon is usually only considered in younger, more active patients who need receovery of full shoulder strength, such as athletes or construction workers. It also may be considered in those with partial tears whose pain and weakness persist after the nonsurgical treatment. For majority of the patients who undergo surgery, they are able to regain full arm strength and function.